In our previous article describing how the idea for Cape Town Embrace was conceptualised, we mentioned in passing that regardless of the ‘great potential’ of the programme concept, it was going to be a tough sell to our Board. The reason for this is that foundations and other bilateral donors tend to operate in very concrete terms. They are, after all, accountable for other people’s money – whether public money, or in the case of the DGMT, the money of its founders. It is far easier to deal with issues of a health programme, an education programme, training etc. than to really get to grips with the “hard soft aspects of social transformation”, as DGMT CEO, David Harrison puts it. Problems such as how you address the social fabric of society, how you build social solidarity, how you give people a sense of real and imminent possibility in life are difficult to address and measure programmatically. It therefore represent high risk investments from the perspective of a progressive donor while a more conservative donor might think it is a waste of money altogether. Some of DGMT board members during a recent visit to NGOs in the Eastern Cape. 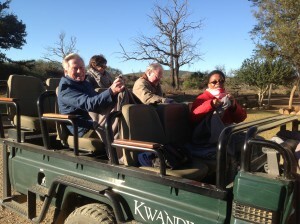 Dave Orton is looking at the camera in the front with Marianne MacRobert in the back, James Inglis in the middle and Shirley Mabusela in the front. Absent on this picture is Ameen Amod and John Volmink. David reports that Dave had a number of questions from an engineer’s point of view about the viability of the proposed project. He was concerned about the scale of the project if we were really taking on board 35 000 new children born every year in Cape Town, and specifically the speed at which the programme would have to go to scale if that is the case. Despite these concerns he really appreciated and understood the concept. With Dave Orton having bought into the concept in principle, David started talking to people in the child development sector and particularly those that had a connection either to the secular service organisations like Rotary as well as many of the faith-based organisations to see if there was an interest. David thought the response was going to be: “Good grief, we are already doing this! This is going to be yet another imposition; we can’t take on more than we are doing at the moment. But it was very interesting, even in these initial conversations there was a feeling that the time was right for a city-wide intervention and for an intervention that enabled the individual churches, mosques etc. to feel that they are part of a larger effort –something that would bring us together. There was an appreciation that many other efforts towards this end, for example the Interfaith Dialogue had limitations because it was not rooted in a really strong common vision – something that we can do together. But, regardless of faith or culture – we can all unite around the children of Cape Town”. When it was clear that the idea had some traction, David contracted Mark Gamble from Educo Africa to conduct a more formal consultation that would try and get feedback across a range of constituencies representing Jewish, Christian, Moslem faiths, secular serving organisations, NGOs that were involved in childhood development, both those that are involved in statutory support (like Child Welfare) and more community grounded NGOs, and finally key people from government departments, for example the Department of Social Development. David reports: “The concern that many people had was that we would be talking with those that would be in favour of the project – that there would be some bias. I am not sure whether there was a way to address this because the people that we were talking to were those people that directly engaged with children. We certainly did not seek to find those people that would be on side; the idea was still evolving and the outcome was still uncertain. So we did that round of discussion and had some really senior leaders participating. People like Mpho Tutu, like the Catholic Archbishop Stephen Brislin, like the Iman Omar from Claremont Mosque who is also the head of the Religious Leaders Forum. It was incredible to see the level of engagement and support and willingness to get involved in an initiative like this”. With that background David and Mark then decided to write-up the results of consultation to the Board: “Given the fact that this is such a different initiative, I was concerned that we did not create a situation where board members had to decide precipitously but rather enable them to start to engage with the process and the thinking about it. So during the process I had also started to talk to some of the Board members as opportunity arose. At our next distribution meeting, David and Mark presented the results of the consultation with the idea of opening the debate. The reception at the meeting was cautious. Concern was expressed that this type of project was fluffy and not concrete enough. There were also a lot of questions about viability. David was tasked to come up with a clearer implementation plan. But before they could even do that, a further request was that this implementation plan be informed by another round of consultation – this time with potential programme participants. In our next article we will share the outcome of that investigation.